Since launching in 2006, Betway has provided its customers with first-class entertainment across sports betting, online casino, slots and bingo. Powered by Microgaming – a global leader in gaming software – Betway's ever expanding, state-of-the-art casino game library offers plenty of choice alongside regular promotions. In 2012, Betway released dedicated Sports and Casino apps giving their customers the chance to enjoy the thrill of playing wherever and whenever via their mobile phone or tablet devices. As an industry leader, Betway is committed to delivering customer satisfaction in every possible way. Customer support is on hand 24/7 and is offered in 17 different languages – reflective of the company's Betway's global reach. Betway are happy to announce that they are introducing NetEnt's award winning software to Betway Vegas. NetEnt is renowned for pushing the limits of online casino gaming with cutting edge technology, high quality 3D animation and uncompromised game quality. The addition of the NetEnt Casino slot games to Betway will see them offer an even greater variety of games, with the highest selection of instant-play casino slot games with enhanced, captivating graphics and fantastic sound effects. With mobile casino capability, NetEnt-powered games are sure to attract players and keep them playing across a range of devices including Android smartphone, tablet, iPad or iPhone. NetEnt games including Atlantis, Gonzos Quest and Starburst Slots. The biggest Progressive Jackpot network on the Internet, Betway casino has created 13 millionaires and paid out $225 million so far. 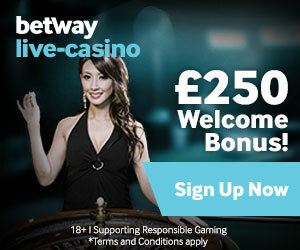 At Betway.com you can hit the jackpot in any of their 21 progressive games. Mega Moolah Mega, King Cashalot, Tunzamunni, Jackpot Deuces, Treasure Nile, Wowpot, Fruit Fiesta, Cash Splash, Major Millions. You can find Free Spins in the Downloaded Casino client. Click on “Slots” and choose the game which you have the Free Spins in. Casino Players are mainly from Sweden, UK United Kingdom, Russia, Norway, Germany, Czech Republic, Latvia, India, Ukraine, Poland.